While the U.S. frets over the loss of incandescent light bulbs, bemoaning the loss of warmth and color in their fluorescent replacements, there comes a great beacon of hope. From beyond the horizon appears a new light source so efficient it promises 20,000 hours of life, so bright it measures 10,000 lumens, and such significant depth of color as to make memories of lamps fade away forever. Truth be told, it’s not a light bulb we’re talking about here, but rather a projector. But the rest of the hype is real. 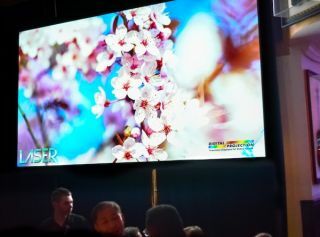 Digital Projection International (DPI) has once again clicked in at “first” with the launch of its HIGHLite LASER WUXGA 3D projector. That’s the mantra at DPI, too, with the appropriately English phrase “fit and forget” emerging from the advanced efforts of the Manchester-based engineering team. In addition to its fundamental lifespan enhancing qualities, HIGHLite Laser comes standard with edge blending and advanced geometric warp correction. Active 3D functionality with frame rates up to 144 Hz is also included. Dual HDMI 1.4, DVI, and 3G-SDI inputs, along with HDBaseT connectivity handle input. Output is managed by a selection of both fixed and zoom lenses, with throw ratios ranging from 0.77:1 to 6.76:1 and extensive lens shift. The crowd of customers and reps gathered at the DPI party were quite pleased with the specs and the proof of same in the brilliant image projected high above their heads. Maybe that goes without saying, since DPI’s reputation in the marketplace is that of a specialist, with a dedicated Application Support team taking calls requesting the most zany of projection solutions on a regular basis. Working in tandem with DPI’s sales, tech support, service, training, simulation/visualization, lamp refurbishment, and in-house client representation teams, the “special ops” Application Support team produces the marquee projects that drive innovation throughout the company. Proof of this was in the packed house at Hard Rock, where InfoComm hoi polloi mingled with the crème de la crème of AV integration and consulting. Then, in another first, DPI proved that there was no shortage of musical talent in this room full of video guys when Levi picked up a guitar and got on stage with DPI southeast market development manager Richard Hill and vice president of sales Chuck Collins. They were joined by AVI-SPL VP of regional sales Jeff Fink on keys and XL Video’s Tommy Malcolm on drums. A rotating cast of musicians took the stage throughout the evening, and the show culminated with a performance by Joe Blacker, who just so happens to be a DPI rep that played with the likes of Miles Davis and other luminaries.DPI stars of stage and screen will begin shipping the HIGHLite Laser in June 2014. Evidently there’s another round of major announcements slated for InfoComm, so look out, people. There’s a whole lot of light projected ahead.